The unique design of the DFG 500™ has two ballast weights that can be removed, together with precise adjustment of the fulcrum for the rear wheel allows for perfect grinding in all types of situations. Environmental considerations are fully controlled with an adjustable dust skirt for dry use and a facility for using water when wet grinding. Noise is kept to minimum by use of high power 3 phase electric motors and drive belt systems. The DFG 500™ is manufactured to a high specification and operates using two grinding heads. A hydraulic raise and lower facility is easily operated by push button switches mounted on the handle bars. The net weight is in excess of 300kg but one operator can easily control the machine. Low operational noise, little or no impact vibrations, consistent diamond wear rates and ease of operation make the DFG 500™ an excellent choice for economical and productive floor grinding. The DFG 500™ is also produced in a twin speed version giving operation speeds of 700 and 1400 r.p.m. 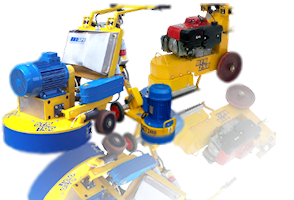 The slower speed being designed and introduced for the grinding of terrazzo and marble applications when using the SPE polymer diamond system. Optional higher rpm head speeds are available upon request.